In my previous post I talked about the new Mac Pro announced by Apple on 10 June 2013. I’m pleased Apple are finally supporting pro users again as many of us have felt rather left behind of late. This week Apple have further reached out to the pro community by launching a new version of Logic Pro – early indications are that this is a solid upgrade to Apple’s leading audio software. But let’s get back to the issue in hand – the new Mac Pro. My main area of concern with the new machine is one of storage. My current Mac Pro has 4 drive bays into which I’ve been able to add (and replace when required) several hard drives to cope with my operating system, applications and data. No need for any external nastiness caused by chassis, cables and power points. I plug in a new/replacement hard drive and just carry on as before. Internal expansion – What internal expansion? The new Mac Pro, however, has no internal expansion. Apple are pinning their hopes on users being happy with plugging external devices into the Thunderbolt 2 ports. It also comes with USB 3 and gigabit ethernet so there are plenty of expansion options – however these all require additional and likely pricey purchases, as well as cables to connect them to the computer and – let’s not forget – a free socket to plug the new hardware in to. Unlike many of my professional colleagues, I’m trying to look at this change as a chance to review my workflow. Yes, given the choice, I’d prefer some kind of internal expansion option for hard drives to be in the new Pro. However, I completely get why Apple are going down this road. Gone are the days when you could release a tower computer and expect that design to last for a decade or more. Technology continues to progress at an alarming rate. (Don’t get me started on 3D printers – they give me the creeps.) If you think about it, it makes sense to have a small computer that packs a whole load of punch into which you can plug in whatever devices you need now… and also in the future. There are down sides to this logic as it doesn’t look as if you will be able to upgrade the graphics cards in the new machine; something that many people do with the current format Mac Pros to extend their life. However – past Mac Pros didn’t always come with the most cutting edge graphics inside and this new model is absolutely bleeding edge so perhaps that’s not such a big issue. It looks like you’ll be able to replace the RAM and I also have a feeling that the on-board PCIe Flash storage will be replaceable on a removable card – it looks like that although the price will (at least initially) be uber-expensive even if it’s possible at all. For video professionals, the obvious route will be Thunderbolt 2. The new Mac Pro is likely to be the first device to have TB 2 in it and I’ll be surprised if there are any affordable TB 2 compatible devices out there to make use of these new ports when the machine launches. TB 1 is no slouch, however, so I suppose this will offer those who need fast data storage something to use in the interim. I hope that some TB 1 external devices will be firmware upgradable to support TB 2 although I suspect that some kind of hardware upgrade will also be required. I’ve got a USB 2 external drive that can be upgraded to USB 3 with a new part and firmware so I’d hope that that this kind of thing will be possible for those who need it. Personally, I’m hoping that the on board PCIe Flash storage has an option around the 500MB mark. This would give plenty of room for the OS, my applications and also some wriggle room for scratch space and working space for any projects that really need fast access – such as video editing. I’m thinking that any finished work (or data that doesn’t require fast access such as web work and iOS code) could be stored externally. Rather than doing this to a Thunderbolt device, my thoughts at the moment, are to go down the NAS route. This would solve more than one problem. It puts my data on a central hub for access by any device on my network without requiring my main computer to be switched on. It can also be an FTP/Web server thereby replacing my ageing PowerPC Mac Mini used for that purpose at moment. The Mac Mini going would free up a vital power socket for the NAS). A NAS can offer me RAID thereby giving me constant backup to replace Time Machine. I’m thinking of adopting a local GIT repository for versioning. I can continue to do weekly external backups to a USB or Thunderbolt drive to store off-site like I do at the moment using SuperDuper! although the NAS devices I’ve looked at have an automated backup to USB that can be configured that works in a similar way. 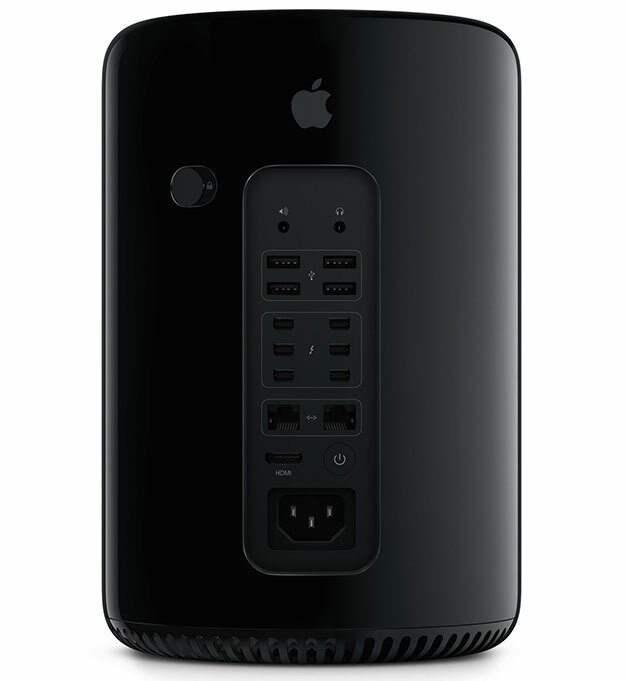 The new Mac Pro has all of its external ports together on the back. The idea is that you rotate the machine when you need to plug anything into a port. When you do so, the ports helpfully light up so you can see where they are. I’m not the first person who on seeing this on the WWDC live keynote stream on 10 June immediately thought that that won’t work. When you’ve got just a handful of cables plugged in to the Pro (including a kettle lead for power) when you try to twist the machine to plug in, say, a USB stick you’re going pull half the contents of your desk across with it, tangle the cables up and probably knock over your chosen beverage at the same time. Who came up with that? Sounds barmy to me. I expect to see that idea tweaked somewhat in future revisions. Despite my reservations about internal storage and the rotating-the-machine-cable-jumble problem, overall I see many positives to changing my workflow. Having to use an external device for storage doesn’t have to be the great disappointment that some people are saying that it will be for them. I only wish Apple would release firm specs for the new machine including the capacity of the internal PCIe Flash storage. I wouldn’t even particularly care if they didn’t announce the price – just tell us exactly what the spec is and I’ll be happy because if they did that I could buy a NAS device now meaning my wallet would have time to recover before I want to purchase a new Mac Pro later in the year. This entry was posted in Computing, Hardware, Technology on July 17, 2013 by AJClayton. When Apple finally announced the new Mac Pro on 10 June 2013 I didn’t blog about it at the time mainly because my new blog hadn’t launched yet. I tweeted about it but otherwise left my thoughts to myself. It’s now time to say what I think! First of all (for those of you who aren’t as nerdy as I am) a quick recap about where we’ve got to. The Mac Pro is Apple’s flagship product – it’s the one that’s the most expensive to buy and has, until recent years at least, carried the most up to date technology and raw horse power. The computer received updates to its spec every two years since it’s initial launch in August 2006 (as the final Apple desktop to be transitioned from a PowerPC architecture to Intel) up until August 2010. I purchased an original Mac Pro 1,1 in April 2007 and had come to the conclusion by Spring 2011 that I would probably need to upgrade the machine in 2012. Happily, I thought at the time, this would likely coincide with an update to the machine. By the time 2012 came, however, many analysts were predicting the demise of the Mac Pro. Desktop sales had been falling since the introduction of the iPad, technology such as Thunderbolt and USB 3 had been added to most of Apple’s other desktop and laptop computers but the Mac Pro had received no love from Apple in some time. “It’s dead” said the experts. Personally I thought otherwise. There were valid technical reasons why the Mac Pro hadn’t been updated to Thunderbolt. Worryingly the technical roadmap didn’t point to Thunderbolt compatibility being ready for mass-market until late 2013, however I thought that Apple might have a trick up its sleeve. They’d pulled a rabbit out of the hat several times in the past so I was hopefully they’d do it again! However, I was to be disappointed. June 2012’s Worldwide Developer Conference (WWDC) the ideal place for an announcement came and went without a mention. I’m not a fan of Facebook, but a page on there asking for “(New) Mac Pros Please” started by video professional Lou Borella, received a massive number of likes and this, coupled with a rather full in-box for Apple CEO Tim Cook berating him for lack of innovation in the Pro market, forced something really unusual to happen. Shortly after the WWDC “no-news” keynote, Tim Cook replied to one of these email messages saying that a new Mac Pro was on the way; or at least “Something really great … later in 2013”. The “later in 2013” bit wasn’t good news, but being a cup half full kind of a guy I was pleased that “something” was on the way. That “something” was announced on 10 June at WWDC 2013. The new Mac Pro that will launch some time before the end of the year is a radical new machine. It bears no resemblance to the old model other than its name. It’s a cylinder with what’s been described as “thermal core” around which 3 PCBs sit in a triangular formation. The new machine has dual GPU’s, on-board PCIe Flash storage and what looks like 4 ram slots. It has 6 Thunderbolt 2 ports, 4 USB 3, an HDMI slot and dual gigabit ethernet as well as the latest “ac” spec WiFi. There’s one big fan right at the top. It’s also really small – just one eighth the volume of the previous model. It also looks like Darth Vader’s helmet (the one on his head). I’ve written a follow up blog post about my biggest question – the one of storage. The old Pro had 4 internal drive bays, 8 ram slots and 3 PCIe express slots whereas the new model has no internal drive bays, 4 ram slots and no PCIe expansion at all. Some may say that’s a step backwards, but Apple’s answer is that you can plug in any amount of expansion (well not any amount, but more than you’re likely to ever need) into the various slots on the back (these even light up as you turn the machine around although I’ll have more to say on that in my next post). It looks like you’ll be able to update the RAM in the 4-slots. The PCIe Flash looks as if it may be on a replaceable card (although the capacity of this initially is likely to be limited). Other than that, there doesn’t look to be any other internal expansion – it’s all outside of the box (which is what Apple what us all to think like). I’ll have more on this next time as the announcement (while welcome) threw up as many questions as it answered. In summary, however, I must say that I’m pleased that Apple are sticking with the Pro market, delighted that they’re trying to innovate in what is a shrinking market and above all intend to embrace it as much as I can taking the challenges that it offers as a chance to improve and move forward rather than stagnate and complain. This entry was posted in Computing, Hardware, Technology on July 15, 2013 by AJClayton. I started playing the Alto Saxophone in early 2008 at the age of 38. Quite late in life to start a musical instrument from scratch! I was inspired to take up the instrument when I heard an interview on BBC Radio Five Live in the Autumn of 2007. It was about “Take It Away“, an incentive scheme that offers interest free loans to parents wishing to purchase instruments for their children. It’s a great way to get kids interested in music without having to splash out what can be a large amount of money for the required tools. Listening to the broadcast driving to work that Autumn morning I was reminded of my interest in the saxophone and how I’d never quite got around to learning it. I just never seemed to have the time to do it. With 40 rapidly approaching on the horizon this was something of a disappointment. “Perhaps I’ve left it too late” I thought to myself. I decided to do some internet research and discovered a local teacher with whom I tentatively arrange a lesson for early in January 2008. I was allowed to hire an instrument from her to see how I got on with it and had a number of lessons to teach me the basics. I fell in love with the sax straight away. I knew right from the beginning that this was something that I should’ve done years earlier. I progressed quickly and took my first sax exam – Trinity Guildhall Grade 5 – in June 2009. I was delighted (and somewhat bemused) to pass with a Merit! Fast forward to today and in the intervening years (despite changing tutor and taking several months off from playing because of a bout of sciatica) I have continued my love affair with the Alto Saxophone. In December 2012 I purchased a Yamaha YAS-62 – a step up from the John Packer 141 Blues student sax I’d learned the basics on. It was with my new musical instrument that on Saturday 29 June 2013 I attempted Trinity Guildhall Grade 6. Once again, I passed achieving a Merit. Something of a miracle and due in no small part to my wonderful music teacher Lesley. I would urge anyone of whatever age to give music a go! If you’ve always wanted to play an instrument but thought, as I did, that you’d left it too late then think again… It’s never too late! This entry was posted in Music, Saxophone on July 8, 2013 by AJClayton. This is the first post of my new blog. I’ve written things on the internet since the mid-1990’s. I was the first person I knew who had an internet connection. At the time I had an e-mail address (supplied by the now defunct Bournemouth Internet) on my Commodore Amiga but didn’t know anyone else who had e-mail address for me to send a message to. Back then there were web browsers (Netscape and a truly awful Amiga browser that I can’t recall the name of at the moment) but things were so new on the internet that there were other fledgling protocols to try out. No Google, so not easy to find things to read (not that there was much out there at the time). I created my first web page around this time, experimenting with the relatively new Hypertext Markup Language. Little did I know at the time that by the end of the following decade I’d be working full time for myself using that language (and many derivatives of it) every day from my home office. Although I’ve written plenty of things in the past I’m undecided at the time of writing this if I will trawl through old databases (and some hard coded files) to retrieve the text and add the posts to this blog. I may do, in which case this will no longer be the first entry. That may be more confusion than I can handle at the moment so I’ll sign off there. If you want to know more about me then please click the “About me” menu item somewhere on this page. This entry was posted in Computing, Internet, Technology on July 4, 2013 by AJClayton.